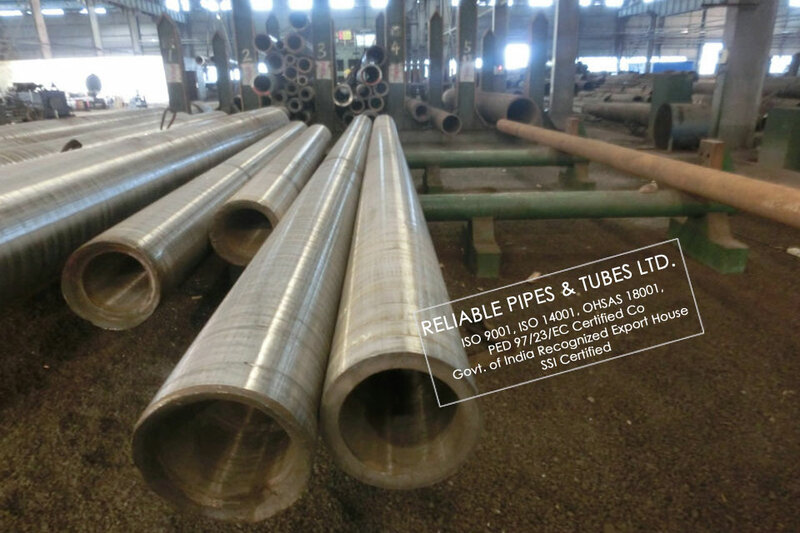 Reliable Pipes & Tubes Ltd. offers a wide-range of carbon steel pipes. The term carbon steel pipe is quite broad in scope and can be used to describe a wide range of metal tubular goods whose main alloying element is carbon. 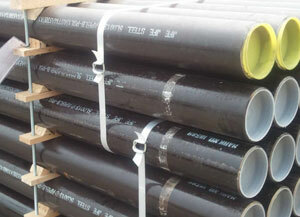 Although many of the same manufacturing principles apply to both carbon steel pipe and various similar alloy tubular goods, the focus of this narrative will be on the manufacturing process of mild carbon steel pipe goods commonly used for oil and gas as well as water transmission, structural applications, general purpose casing, piling, and mechanical components. Carbon steel pipe starts out by arriving at the pipe mill in the form of either a billet (basically a large solid steel bar) or a coil (imagine a roll of toilet paper made out of steel). Depending on the manufacturing method used by the mill, these billets or coils will be processed to yield the finished end product. We will examine the various manufacturing methods used to make carbon steel pipe, but first let’s look at how the carbon steel got here in the first place. Carbon Steel Pipes mainly used in the most critical engineering applications and also in certain applications in the automotive sector. In addition, some of the value-added Carbon Steel Pipe include steel for LPG cylinders, API grade, corrosion resistant steel, critical structural application steel, boiler quality, auto grades, precision tubes and medium/high carbon grades, among others. Humans have been melting iron ore through a process called smelting for thousands of years. Molten or semi-molten iron would be hammered (forged) or poured into their desired shapes and allowed to cool. People quickly discovered that the properties of the finished product (strength, ductility, longevity) could be controlled in many ways; manipulating cooling time and conditions or adding/removing certain media for example. Carbon steel was one such popular derivative of raw iron made by introducing elemental carbon into the smelting process in the form of charcoal. As useful as steel was, it was time and labor intensive to produce, thus making it generally a poor material for mass consumption. In the mid 19th century, the Bessemer process was patented where by molten pig iron (cheaply made and full of high carbon, silicon, and manganese impurities) is subject to blasts of oxygen which oxidize the impurities thus making them simple to remove from the molten steel. This method of removing excess elements was much easier and cheaper than adding alloying elements to iron, and is directly responsible for the industrial revolution and the beginning of the mass production of carbon steel. Today the technology has changed, but the same basic principles of the Bessemer Process are still the backbone for modern raw steel production. 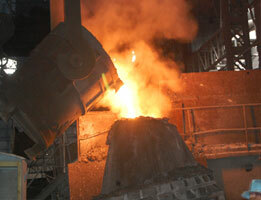 Modern steel mills produce steel by either melting scrap metal or adding coke (pulverized coal with the hydrocarbons removed) to smelted iron ore. The molten metal is subject to a modern derivative of the Bessemer Process to remove undesirable elements, other desirable elements are then added (depending on the final desired properties of the steel), and then the steel is cast and cooled into which ever shape the customers desire. 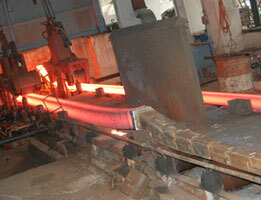 As mentioned prior, in the case of carbon steel pipe these casts are typically in the form of coils or billets. Billets and coils are delivered to the pipe mill ready to be made into carbon steel pipe. Depending on the capabilities of the pipe mill and the end use of the final product, the casts will be formed into pipe by means of four distinct different manufacturing methods; seamless, electric resistance weld (ERW), double submerged arc weld (DSAW), or spiral weld. The double submerged arc weld (DSAW) process is similar to that of the ERW process in that coils of carbon steel are unrolled in a continuous ribbon. As the DSAW method of manufacturing is typically used for larger diameter pipe, the method of roll forming the skelp is similar to but not exactly like that of ERW. DSAW pipe is typically either pyramid rolled (three angled OD rolls in the shape of a pyramid form the pipe) or rolled using the U-O-E process (skelp is first subject to a "U" shaped press, followed by a "O" shaped press). 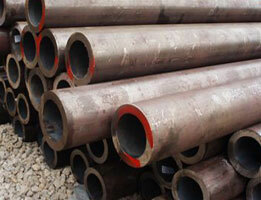 The most prominent difference between ERW and DSAW carbon steel pipe is the longitudinal weld. 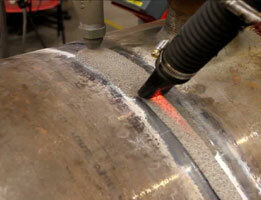 The DSAW arc weld is submerged in a flux media to keep the weld from being exposed to ambient contaminants. Also, both the OD and the ID of the pipe is welded, typically at separate times creating a situation where one weld consumes the other creating a higher quality weld. 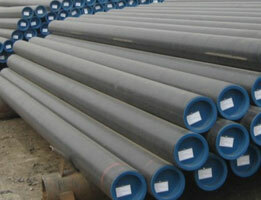 DSAW carbon steel pipe is easily distinguishable due to its prominent and consistent ID and OD weld seam. Common DSAW specs include; API5l, A252, and A139. 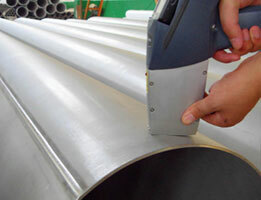 The most easily distinguishable manufacturing method for carbon steel pipe is spiral weld. In this process the weld is created in the exact same manner as that of DSAW, only the weld seam takes on a helical or spiral appearance due to the way the skelp is rolled to form. Just as in the case with the ERW and DSAW process, a continuous ribbon of skelp is leveled and sent through a series of rolls to form. In the case of the spiral weld process a simple three roll bend is typical and thus makes for faster, more efficient, and less costly manufacturing process. The spiral weld process also allows the mill to roll a much wider range of sizes than DSAW or ERW mills. 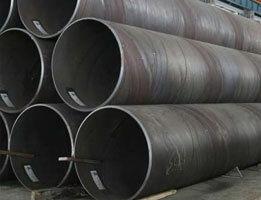 Also, due to its axial symmetry, spiral weld carbon steel pipe has an inherent ability to maintain straightness. Common spiral weld specs include; API5LB and A252. Contact us for your next carbon steel pipe project. Manufacturer of Carbon Steel Tube ASME SA / ASTM A106 GR.A, ASME SA / ASTM A106 GR.B, ASME SA / ASTM A106 GR.C,ASME SA / ASTM A53 GR.A, ASME SA / ASTM A53 GR.B, API 5L PSL 1 GR.A, API 5L PSL 2 GR.B, DIN 2391 ST35, DIN 2391 ST37, IS 1239 YST 210 / 240 / 310 / 355, IS 1161 YST 210 / 240 / 310 / 355, IS 4923 FE 330, EN 10219 S235JRH, and more, Carbon Steel Rectangular Tubes, Carbon Steel Seamless Tubing stockist, Carbon Steel Welded Tube Stockiest, Carbon Steel Square Tube suppliers, Exporter of Carbon Steel Erw Tubing, Carbon Steel Efw Tube trader, Carbon Steel High Temperature Tube distributor, Carbon Steel Heat Exchanger Tubes Manufacturer & Suppliers.